Cabbage doesn’t have to be boring! 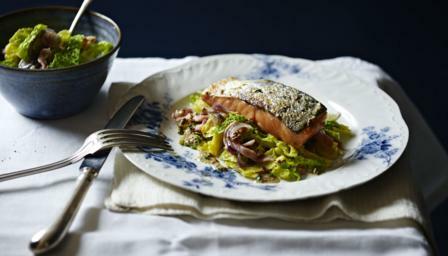 Try it sautéed with bacon and mushrooms for a healthy and tasty accompaniment to salmon. Heat the butter in a large pan, add the onion and fry gently for five minutes. Brush each side of the salmon with olive oil. Heat a non-stick frying pan, when hot add the salmon and leave to seal in the pan. Turn over halfway through cooking. Add the shredded cabbage to the bacon and onions and stir. Cover with a tight fitting lid and continue to cook for 10 minutes, stirring occasionally. This will ensure the cabbage will absorb the butter and retain moisture. At the end of cooking, season, then serve in a large bowl placing the salmon on top. Spoon the dressing around the edge.